MoP Release – Digital or Box? 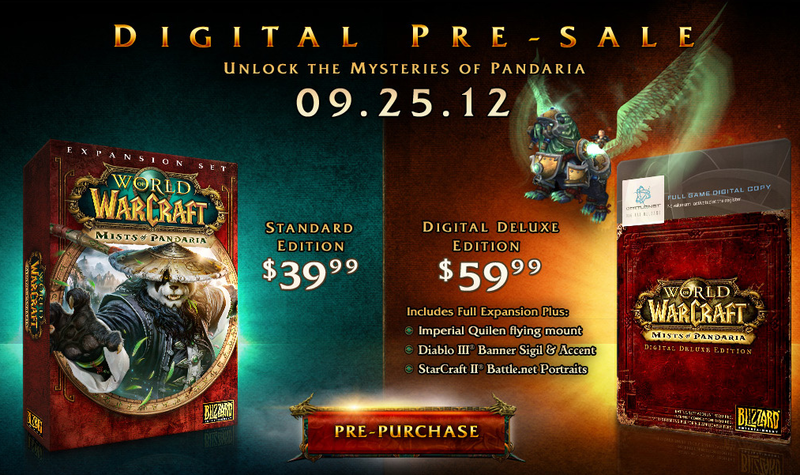 I missed this when it went live, the Mists of Pandaria release date is confirmed for 25 September 2012. Seen also in the BattleNet pages. Sep 25 is the date, and means we have a date to aim for. It also makes more sense that the PTR and beta ramp down still have time to make changes. So yay. Happy times. Now fans have to decide if they purchase the game, and if they do is it a collector’s edition or standard, and a digital download or a box? The collector’s edition box this expansion contains the same as previous years. Pets, mounts, and some side material (see the screenie below). Frankly a physical copy is not very enticing, and digital is the way to go now. Sure, you miss out on the cardboard, mouse-mat, some misc tokens, and DVDs, but overall the cost in Australia is $60 vs $100 for the Collector’s edition. I can use that $40 difference on something else, and I also don’t have to put up with lining up late at night, or waiting, or even a store. At best I might take the digital collectors, but standard looks very appealing. This does not mean that I’m unhappy with WoW as a game, not at all. It just means that after buying three collector’s editions and noting that I’ve used less and less of the items, I’m now resigned to getting the game, and not banners for StarCraft or Diablo 3. I don’t care what is added for SC or D3. If 22 June is start of raid testing, then with a couple of beta builds and tuning – live in 2-ish months – say mid Sep. I can’t remember what the other expansion timeframes were but they will need a month to ship and hype. This entry was posted in Warcraft and tagged Battle.net, Mists of Pandaria, mop, release date, world of warcraft, wow by Typhoonandrew. Bookmark the permalink. heh, your kidlet will know the ding! noise as much as Olivia now relaxes when StarWars clone wars starts. Never too early to train them. You might be surprised by how much sleep you need during that time too Jez, Mel was absolutely smashed for the first 6 weeks.